Building work is driving contractors order books according to new construction market research by Glenigan. Kier won more work overall than any other contractor last year and this came as the group’s order book for building work leapt by 36%. 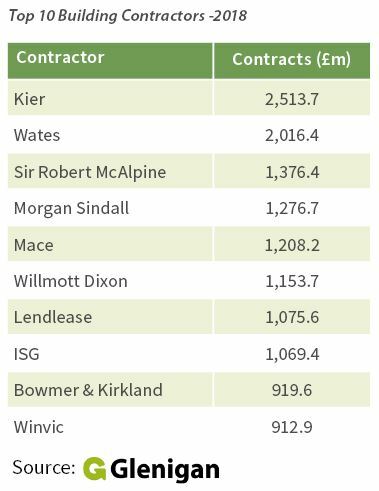 As a result, Kier replaces Sir Robert McAlpine as the top building contractor in 2018 on the value of contracts won according to Glenigan’s construction industry analysis. Sir Robert McAlpine’s building order book shrank 49% last year but half of the top 10 won more building work in 2018 than in 2017. Wates’ work on the Northern Estate renovation project at the House of Commons in London helped grow building orders by 51% in 2018 and pushed the group into second spot. New entrants into the rankings of the industry’s top 10 building contractors include ISG, which rose from twelfth in 2017 to eighth place last year as building work increased by 11%. 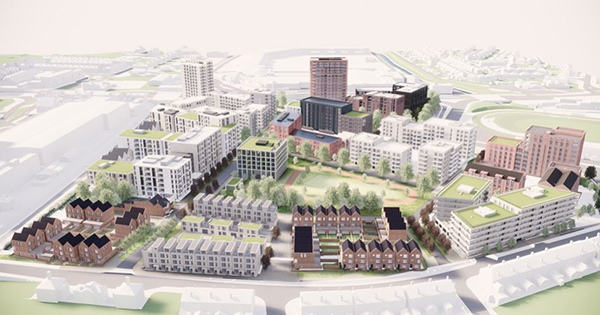 Lendlease’s success in securing the main £350 million Commonwealth Games project in Birmingham lifted building orders by 14% last year, when the Australian-owned company was ranked seventh. Winvic breaks into the top 10 as the group’s dominance of the industrial, warehouse and logistics sector, particularly in the East Midlands, sent building orders up 10%. Overall building orders at the top 100 contractors sagged by 16% last year to £31.6 billion compared to £37.7 billion in 2017. Building work provided 85% of the contracts by value at order books amongst the top 100 contractors in 2018. This is up from 79% in 2017 as civil engineering orders subsided at an even faster rate. Tarmac was the most successful roads contractor in 2018 was partly due to a £1 billion contract for Highways England to carry out the strategic road network resurfacing programme. Balfour Beatty had been top in 2017 after bagging major projects including work on the Hinckley power station project. The group’s civil order construction book shrank by more than 70% last year, when Balfour finished fourth. Carillion had been among the top 10 civil contractors in 2017, but has vanished, while Skanska also drops out. New entrants in the top 10 include Murphy, which last year won a slew of major civils schemes including a £60 million anaerobic digestion plant in Huddersfield and a £57 million sewage & sludge treatment plant in Hull. With Murphy also bagging major civils deals for the Ministry of Defence and National Grid, the group was ranked seventh in 2018. Overall civil engineering work at the top 100 contractors shrank to £5.7 billion from just over £10 billion in 2017. Of the top 100 contractors, 57 companies had won contracts for some form of civil engineering work last year, which was exactly the same number as in 2017. 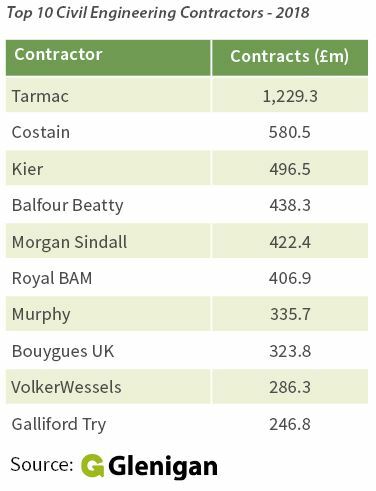 However, civil engineering orders only outstripped building work by value at five contractors in the entire top 100: Tarmac, Costain, Murphy, VolkerWessels and Hochtief.